Now it seems that the news media has had just about enough of President Trump’s anti-press rhetoric: recently, they decided to come together and speak up about it. It all started with Marjorie Pritchard, deputy managing editor of the editorial page of the Boston Globe. She led the effort with more than 350 newspapers across the country to coordinate publication of editorials supporting freedom of the press and condemning the president’s constant drumbeat of messages denouncing the news media. 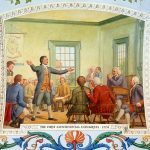 Civics Lesson: Why Is Freedom of the Press So Important? We should point out here that the word “liberal” meant something quite different in the 1770s than it does now. At that time, they were speaking of classic liberalism, a political ideology that values the freedom of individuals—including the freedom of religion, speech, press, assembly, and markets—as well as limited government. This definition drew on the economic writings of Adam Smith and the growing idea of social progress. Photo: Detail from a painting of the First Continental Congress. Credit: Architect of the Capitol. 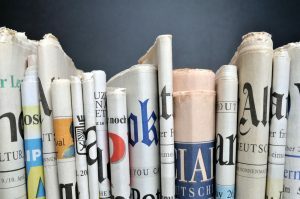 Each of the newspapers ran an editorial—typically written by opinion writers and considered separate from organizations’ news coverage—defending freedom of the press. What do you think? Was it a good idea for newspapers all across the country to run editorials criticizing President Trump’s attitudes toward the press, or do you, like Jack Shafer, believe that it’s going to backfire and give the president more ammunition for his claims that the press is against him? Share your thoughts in the comments!